DTC Magnifier Ver. 7 Car Diagnostic System represent the cutting edge of automotive diagnostic technology, providing dealer quality electronic diagnostics for the independent workshop in one Simple and affordable unit. It has much better vehicle coverage, systems analysis and vehicle tuning abilities then all latest car diagnostic systems available in world. And it’s truly the ultimate recommendation and life-saver for hard-core mechanics or car workshops. This is not recommended for home car users. 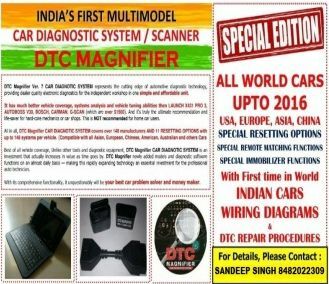 All in all, DTC Magnifier Car Diagnostic System covers over 148 manufactures AND 11 resetting option with up to 148 systems per vehicle. (Compatible with all Asian, European, Chinese, American, Australian and others Cars). Best of all vehicle coverage, unlike other tools and diagnostic equipments, DTC Magnifier Car Diagnostic System is an investment that actually increase in value as time goes by. DTC Magnifier newly added models and diagnostic software functions on an almost daily basis-making this rapidly expanding technology an essential investment for the professional auto technician. Leather Keyboard cover for 7” Screen. Extensions lead for OBD-II Connector. All World Class UPTO 2016-2017 USA, EUROPE, ASIA, CHINA. With First Time in world Indian Cars Wiring Diagrams & DTC repair Procedures. USB Cable for D06/MP48 and Lovato cng/lpg conversion Kits. Software CD for outside fitted CNG/LPG Calibration, programming and mapping. Aeb – Nano, Europegas, Nevo Plus, Igs, Vialle. Ag – Torpedo, Brc(without License) Nevo Pro, Lovato, Zavoli Aeb. Zenit – Auto Moto, Msequent, Diego, Lpgtech. Compact – Automoto Aeb, Compact, Landi Renzo, Omvl. Alex Optima – Avance, Kme Nevo,Lis,Versus and all Mp-48 Ecu Programming, Mapping and Calibration Software.